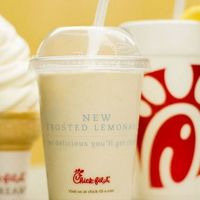 Frosted lemonade like the ones from Chick-Fil-A, which are vanilla soft-serve ice cream blended with lemonade. Add Koolada to taste if desired. Loved this recipe. Definitely needs more than 2 days steep. I added 1% vanilla shisha to dial up the vanilla notes and to accent the lemons more. The weird things is that some people have said the lemon is too strong. Not for me. horses for courses as they say. Good stuff, but I think it needs a longer steep than recommended. Going to try it with the Koolada next. I added a few drops of Koolada. After 4 days, this becomes amazing. Nice simple, delicious, and satisfying recipe. I'm a big fan of this mixer's Fresh Lemonade recipe, and I couldn't have imagined loving anything as much, but this version is so sweet, satisfying and incredibly balanced. A little less intense than it's fresh counterpart, this recipe has just enough creamy vanilla sweetness to give it some body, but it's not too heavy for a hot summer's day. Perfect in every way.